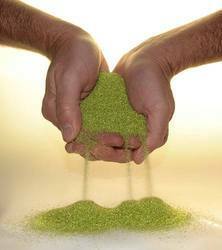 Our range of products include activated filter media (direct replacement of sand). AFM™ stands for Activated Filtration Material, a revolutionary product made from green glass and been used globally by several MNC’s like Heineken, Pepsi etc…. This is the only filtration. AFM is used in the pre-treatment chemical free process of potable and waste water treatment. Some of the features of the product are as follows. •AFM™ works as a Molecular Sieve & also as a Mechanical adsorption like GAC.•The surface area is 300 times more to that of sand. (Sand has 3000 m2/ton & AFM has a 1000000 m2/ton).•The surface has a -70mV charge on it.•The life of the media is more than 10 years.•The media is self sterilising and it does not bio foul hence no mud ball formation or media replacement. •It removes particle size unto 5 micron. Benefits of the product in continual operation are as follows:•No need to change the media for the entire life of filter.•Reduce the chemical consumption by 15-20 %.•Removes heavy metal like iron, manganese, chromium etc … from the water.•Removes organics & disinfection by-products from the water.•Increases the life of the GAC/activated carbon.•Increases the life of RO/UF/resins & prevents the bio fouling.•Prevents bio film formation and pseudomonas problems prevalent in the system.•Controls bromates & bio fouling in the SWRO system.